Etoile Isabel Marant shirt with embroidery trim, dark red piped trim Isabel Marant jeans, and Isabel Marant Dicker boots. I decided to haul my black leather leggings out of the back of the closet. 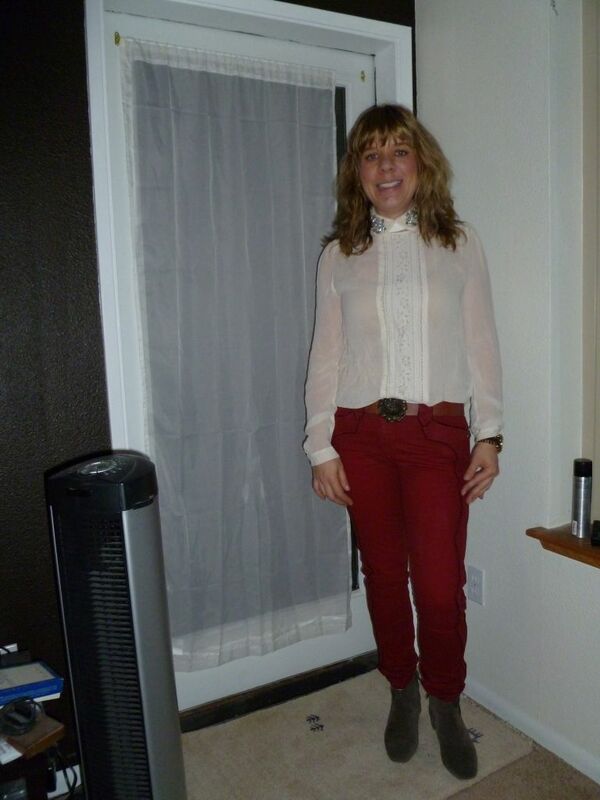 Worn with a big Acne shirt, Aubin and Wills cream sweater and Plomo black suede fringe boots. Tonight is the Nordstrom focus group. 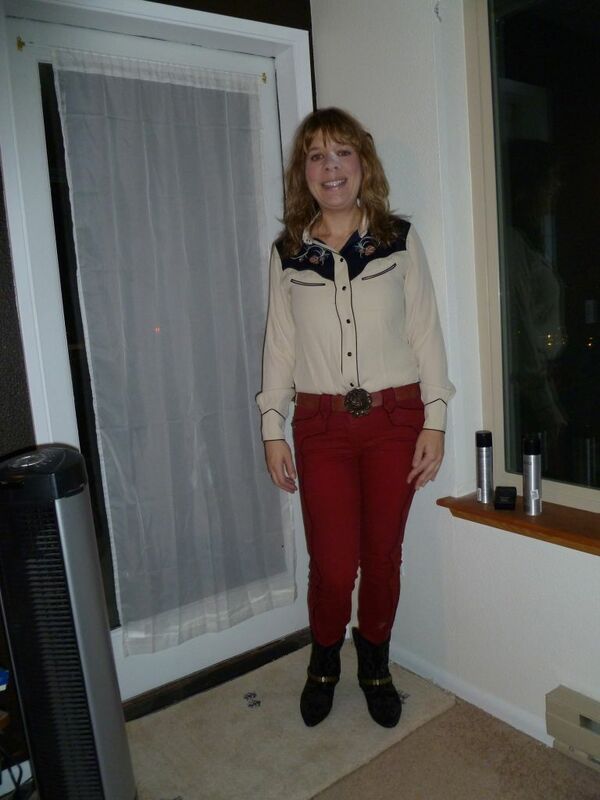 Wearing my Isabel Marant shirt and pants, with my Nine West ankle boots and brass rose buckle belt. Does it count as bookending when your lipstick matches your shoes? 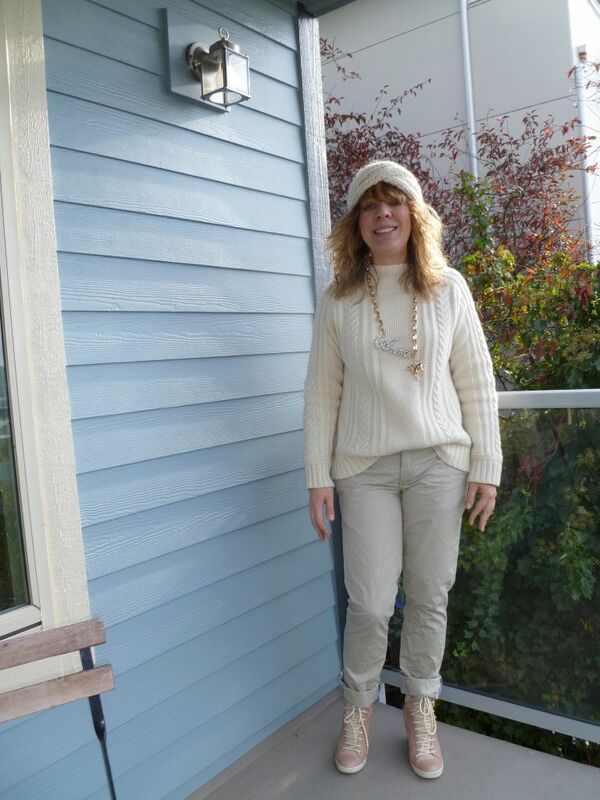 Eugenia Kim knit headband, Aubin and Wills cream sweater, Acne skinny khakis, See by Chloe pink wedge sneakers and Anna Del Russo for H&M name necklace. Sun is low this time of year so light is a bit wonky. Have a coffee date this afternoon. 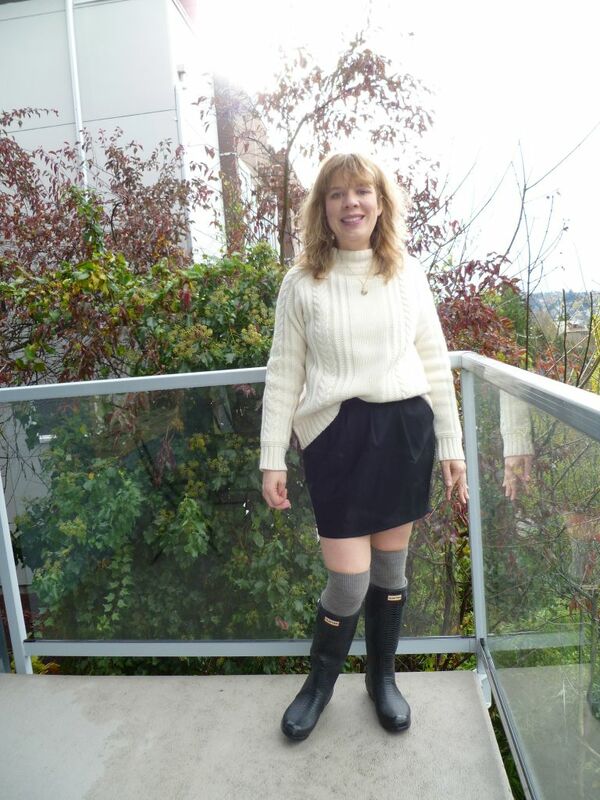 Aubin and Wills cream cabled fisherman's sweater, Elizabeth and James paper bag waist skirt, OTK grey socks, Hunter boa boots, with Theory olive puffer parka and Givenchy Nightingale cabled pattern bag. While I was at the gym this morning I perused the November issue of Lucky. They had one picture of a woman wearing purple geometric print trousers, a floral shirt and leopard platform pumps. I don't have geometric pants, so I tried all my floral pants, too springy. So I decided on these JBrand brocade skinny jeans. 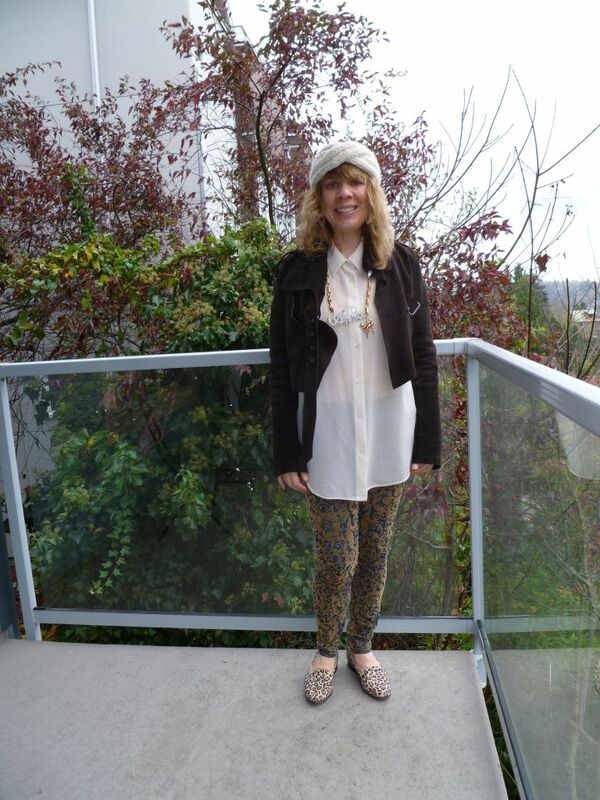 My patterned shirts didn't quite work either, so I went with my taupey/cream Acne blouse, chocolate suede Alexander Wang jacket, Dieppa Restrepo leopard smoking slippers, Eugenia Kim knit headband and H&M Anna Del Russo rhinestone name necklace. Zara lace trimmed shirt and pearl beaded collar. Brass rose belt buckle. Isabel Marant piped trim jeans, and Isabel Marant Dicker boots. This is my first blog post. It is now live. I decided to do my spin on this timeless formula. 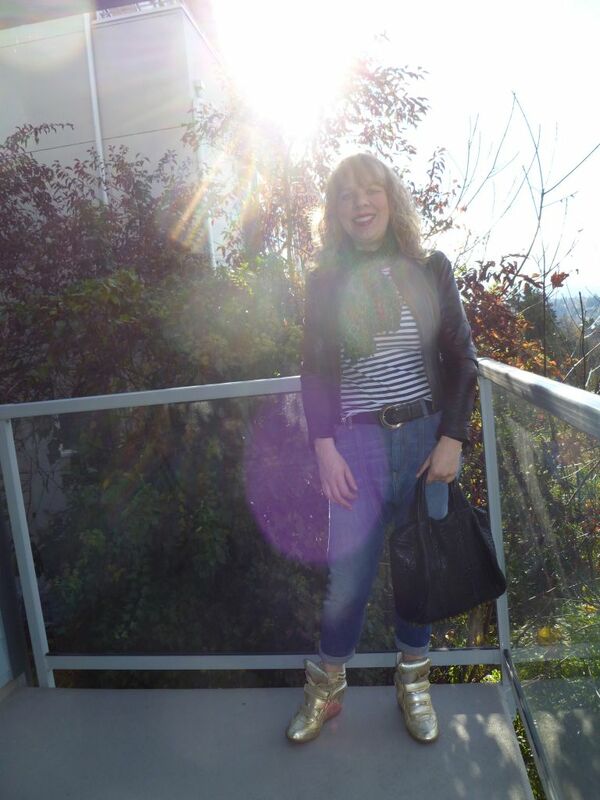 Wearing my new Yayoi Kusama for Louis Vuitton polka dot scarf, Nanette Lepore cropped leather jacket, Rodarte for Target striped tee, R13 harem jeans, Isabel Marant gold wedge sneakers and Alexander Wang bag. Sorry about the lighting. I tried every position on my deck.